A contact recommended him to me, to help write regular blog posts that can be compiled into a monthly newsletter. 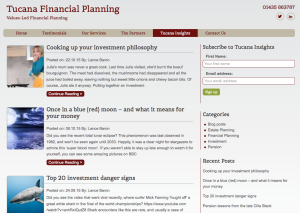 Let’s face it, most financial advice is delivered in a dry, dull and boring style. So we agreed that each post would start with a real-life story, to act as a ‘hook’ and draw readers in. What’s more, instead of graphs, charts and clip-art cartoons, each post would include an intriguing photo to add visual interest and differentiation. Of course the bulk of each article would be topical, useful and interesting news or advice that is relevant to his audience, so demonstrating his expertise. Would you agree? Read the blog. As you know, marketing is all about objectives. So what are the objectives of your blog and newsletter? Here are some ideas. ‘Freshness’ is one of Google’s ranking factors. If you don’t keep your site up-to-date, it can gradually slip down the rankings. 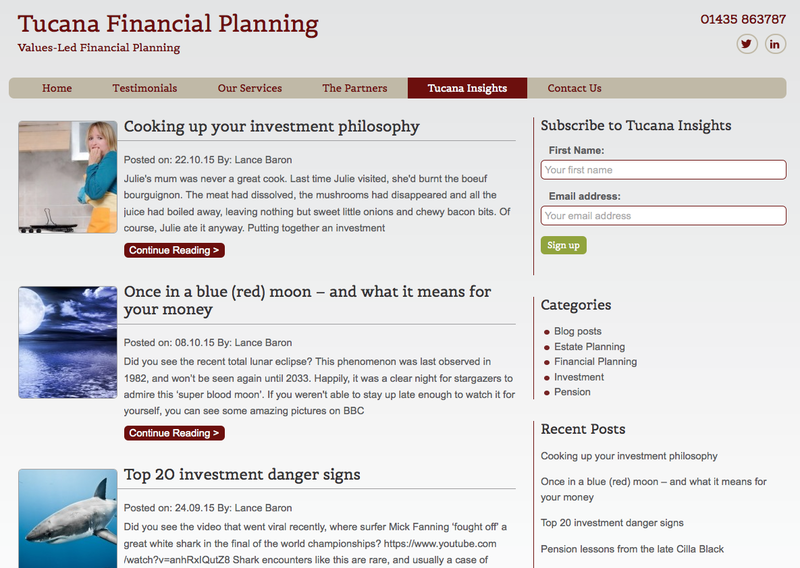 A regularly updated blog is the ideal way to do this. People often write a blog post to act as a landing page for search engine optimisation. They do keyword research to establish what people actually search for, then use that data to inspire their blog titles and content. People also use a blog simply to add value to site visitors (that’s what mine is for). But a blog is passive. It sits there waiting for people to find it. By contrast, a newsletter is active. It goes out and lands directly in the inbox of subscribers. Because readers are busy, your newsletter also needs to add value, not be an advert. Remember, it is likely that your blog and newsletter are read by two different audiences. So it makes sense to repackage your blog content in the form of a newsletter (but don’t call it a ‘newsletter’ because no-one signs up for those any more; I call mine a ‘tipsheet’). Please let me know if you need help with your blog, your newsletter, or both. You too could soon be receiving lovely customer feedback like my IFA client.